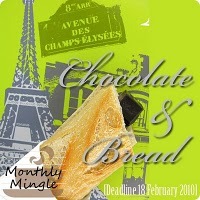 This recipe has been submitted to Monthly Mingle – Bread and Chocolate (February 2010) hosted by Life’s a Feast and What’s for lunch hunney? The whole wheat flour makes the cake healthy. Mashed banana holds the cake together so eggs are not required. Mix oil and sugar in a bowl. Sift wheat flour with baking powder and baking soda on it while mixing the batter. Add banana, vanilla essence and cardamom powder. Slowly add milk tablespoon-by-tablespoon and mix the batter till it is of pouring consistency. The cake will rise and will deflate when cooled. Do not worry. It will retain its shape. This cake is great for people who do not have eggs. Also, for vegans, milk can be replaced with water. 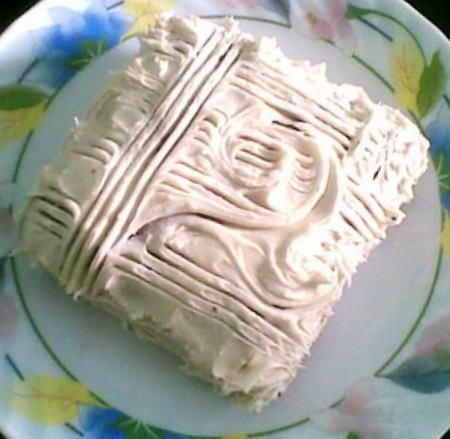 This is a very basic chocolate cake that can be used in any dish or served as is. The twist in the taste is added by the spoonful of white vinegar. Blend the eggs with the unsalted butter and sugar in a mixer. Sift the flour with the baking powder and add cocoa powder to it. Pour the egg mix into a bowl and slowly add flour while rolling the mixture. Add milk teaspoon by teaspoon in case the batter is too thick. When a pouring consistency is attained, add vinegar and vanilla essence to it and roll again. Put the cooker on high flame. Take the baking dish and grease it and dust it with flour. Pour the batter in it. Put the dish in the cooker and bake for half an hour. Insert a knife in the centre of the cake after half an hour and if the knife comes out clean, the cake is ready. Remove the dish from the cooker and allow to cool for 2-3 mins. Remove the cake and serve once cooled completely.